Hendi Poland is a company which is part of the international Hendi Group, it has been specializing in the production and trade of professional catering equipment for 70 years. Hendi Group is one of the largest suppliers in the eastern market and a well-known producer in the domestic market. Hendi has been operating on the Polish market for 10 years. At that time, the company was based on two separate systems: the image and the online store addressed primarily to wholesale customers. The dynamic development of e-commerce and the growing importance of online sales meant that the board of Hendi decided to start working with i-systems. preparation of infrastructure operating within the multi store. The main objective was to prepare a store which will have a modern design and be able to handle the greatest challenge - lots of content. Emphasis was placed on graphic design, that was intended to be light and transparent. Product sheet was designed so that it could include the greatest amount of information, i.e. : a description, opinions, a contact form, videos, attachments and pictograms facilitating proper classification. A large number of categories and subcategories required improvement of product search. For this purpose, advanced filters were developed. Products are searched basing on such parameters as: product name, keywords, tags and product description. The administrator decides which of the filters will be used for product profile. At the same time, they have the possibility of indicating whether they want the filters to relate to individual products or entire categories or subcategories. All of these actions take place from the panel. Hendi is an online store with a wide range of products. Currently, it consists of nearly three thousand articles, but the number is still growing. During the implementation, work consisting of product management was speeded up. To this end, group editing parameters was introduced. With this feature, administrators have the possibility of assigning some products to a category, group product profile editing, group editing of prices, group editing promotions and group adding pictograms and group flagging products. Group editing parameters from the panel ruled out the need to edit products and thus speeded up the work on the modernization of the store. The new Hendi store is available in three languages: Polish, English and Russian. Each of them has a dedicated content. Through a newsletter or directly at ordering, customers can subscribe to a list of subscribers of the Hendi store. The list of customers, basing on previously entered assumptions is used for the creation of intelligent group of subscribers, for example, wholesale customers from Warsaw. This list is created once and new subscribers, if they meet the specified requirements, are enrolled to it automatically. This makes it easy to reach specific target groups with the offer. In the new online store, abandoned carts module has been introduced (to remind logged customer about unfilled order) and an advanced system of vouchers. The discount vouchers' generator module operates from the panel and enables quick generating any number of codes. Vouchers are generated according to a variety of assumptions - for specific products/product groups, i.e. groups of smart groups developed for products. After creating vouchers, the generator gives the possibility of exporting ready discount codes to a CSV file. All systems of i-systems are created on the basis of responsive web design solutions. As a result, stores are displayed correctly on any device. A responsive website means lower maintenance costs, faster changes, greater availability of the offer and a positive impact on the positioning of pages in Google. The new Hendi store was also based on the solution. The big challenge, due to the wide range and large number of sub-categories, was to prepare the store menu that would be properly displayed on every mobile device. The plan to create a new, responsive layout was based on the principle of mobile first. The start of work on the mobile version, and only later desktop, enabled achieving the highest level of functionality and usability. The applied solutions, in line with the mobile first assumptions, were to be first of all comfortable, simple and intuitive, with simultaneous attention to detail. Thanks to the applied solutions, the store is not only easier to maintain, but also easier to develop. conversion of orders into PA/FV. Work is underway aiming at starting the next two online stores of the Hendi Group. All three stores will be managed from a single panel within the multistore and will be integrated with the ERP system, which will enable real control of all sales and shorten the time of processing orders and eliminate errors. 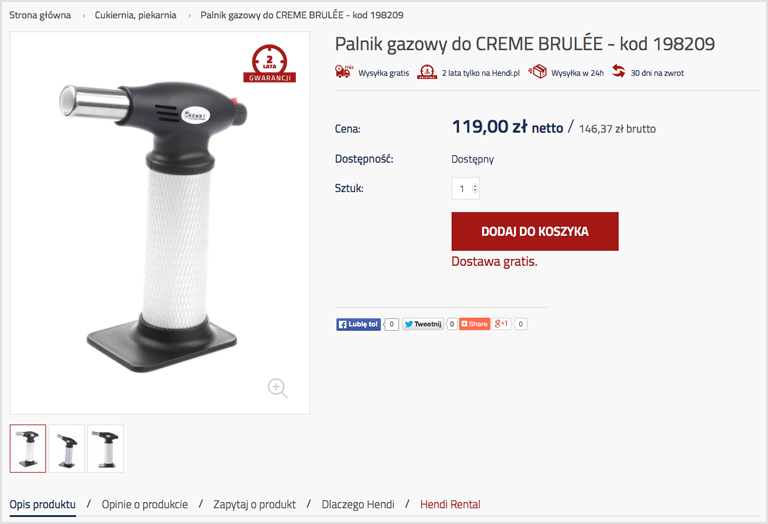 “Knowledge and experience of i-systems have proven to be helpful in building the www.hendi.pl online store. The software that we received from i-systems is intuitive and easy to use and has many useful features. I believe that it is able to meet the expectations of even the most demanding owners of online stores.